The early hours of this morning I was woken by nature’s cruel imperative, and, shuffling back to bed afterwards, happened to take a look out the window at the subtle lines and shades of grey in the darkness outside. Dawn was just starting to appear on the horizon, the merest traces of colour against the black. I continued back to bed, but my mind had seen and wondered what the world would look like all in shades of black and grey and sable. It was no use. Twenty minutes later, I was up and fumbling around in the dark for walking clothes and hair brush, sneaking out of the door as quietly as possible so as to avoid disturbing the sleeping Viking still inhabiting our bed. 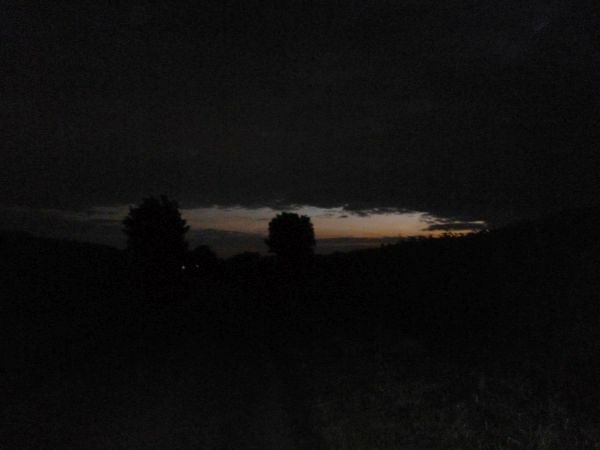 Once downstairs, the time revealed the rather startling news that it was only 5am, but I shrugged and, stepping outside, pulled on my hiking boots and a jacket, then, waiting for my eyes to acclimatise, headed for the road. 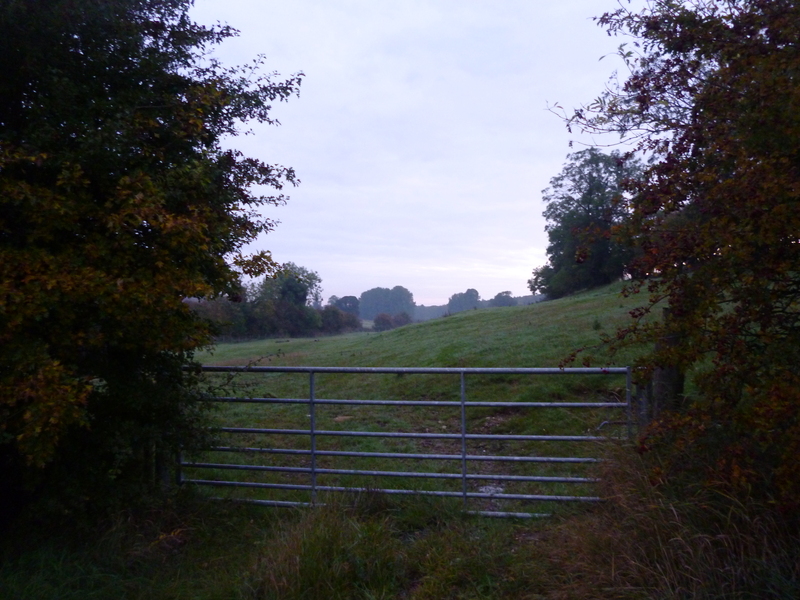 Walking up the hill in near darkness, the road was a faint shimmer of pewter and deepest grey against the more velvet darkness of the verge and hedges, trees looming overhead in vaguely seen shadows. I followed my feet, feeling cut adrift in the dark, almost akin to animal as I crept along in the blackness. Left at the crossroads, I continued along towards the next village, starting to settle into the darkness now, trusting my feet to take me in the right direction, opening my senses to take in the scents and sounds all around me. Owls crying in the nearby woods, and leaves rustling in the breeze. 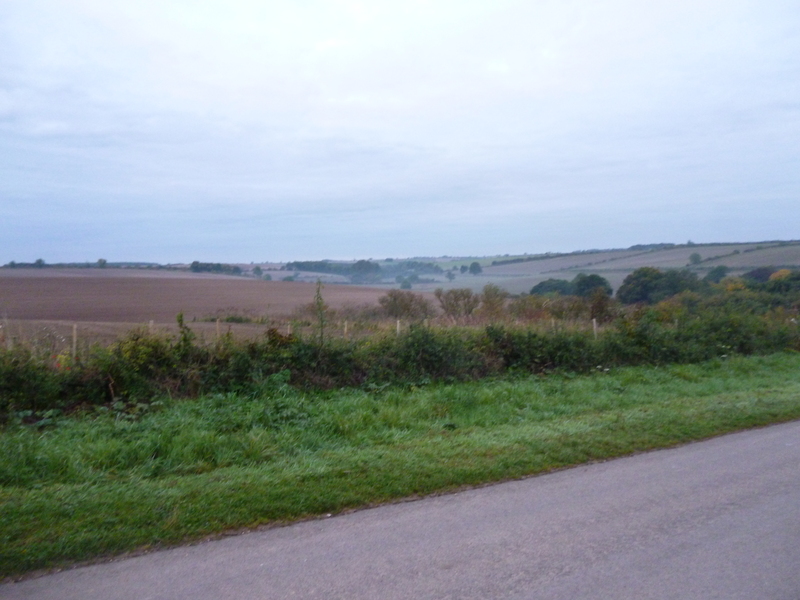 It surprised me all over again which scents come out in the darkness – turned earth, falling apples slowly rotting beneath trees, falling leaves and a slight crispness in the air, instead of the daytime scents of dust and cows which overlays all else. I passed one house on the outskirts, lit with security lights that coloured the sky pink above, and resisted the urge to dart past swiftly, wishing I had a muspel skin cloak to hide under and some dwarves to direct my path, though perhaps it was best after all that I was just out for a walk, not fleeing across hilltops whilst carrying peril about my wrist! Eyes adjusting to the dark again, I trundled along merrily, terrifying one of the local residents who was out walking her dog in the early morning – a very enthusiastic, happy springer spaniel, bringing me back down to earth with a bump. Entering the next village brought some interesting moments – security lights shining through tree branches made a very eldritch pattern indeed on the road, making it hard to see my feet and where I was walking, but once again sound saved me – the sound of Waithe Beck as it trickled past one of the local cottages was a very welcome song, being a close neighbour of mine. Trotting up the hill and turning back towards the village brought my first glimpse of the sunrise, the faintest wash of watercolour blue and green across the far horizon, pale and subtle at first, rising above the treetops like something breathed out by the woods. The chilly air seemed to give birth to elfdance mist as I made my way through the next village, turning often to observe the progress of the sun rise. Branches made runes against the air, telling strange tales as the crows cawed nearby and the birds began to wake up. I kept walking, all bemused by the change in the music around me, as owls gave way to crows and ducks from the nearby pond. Tall spikes of old hogweed flowering stems made my heart beat a little faster for a moment – seen from the corner of the eye in passing, when the light is poor, they resemble nothing so much as tall, skinny goblins by the side of the road, peering at me as I passed. 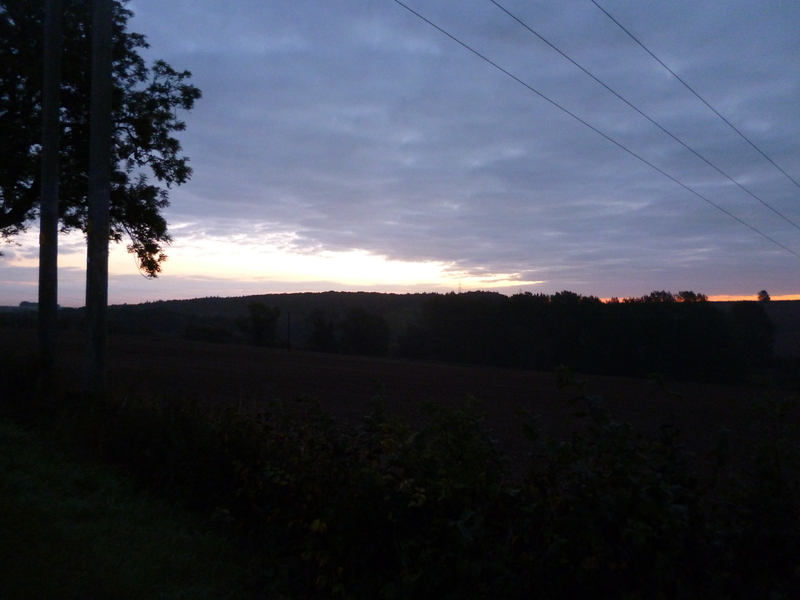 Dawn chorus arrived some time later as I walked along in a semi trance, and I joined in the stately music, boots making a drum beat against the road, laces beating a strange percussion as I walked, breath coming a little faster as I trudged up another hill. 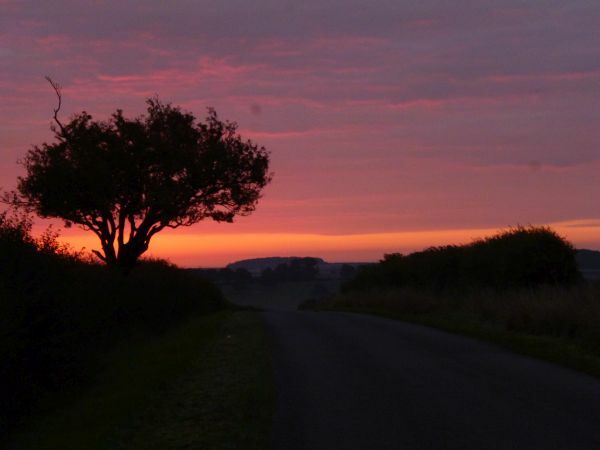 By now the sun was rising ever more swiftly, making his way into a mid October sky and washing it with acid red and salmon pink, trying to creep over the hilltops and slide down into the valleys as I turned left again, towards my home village. Light had arrived now, slowly, and the verges and hedgerows and trees were all soft silvery shades of green and brown and gold, dusted with the silver and sea tones of morning dew as the sun stroked it. My feet were starting to ache, so the walk had turned into a trudge as I made my way up another hill, dodging the slow moving snails as I went, watching for sloes and rosehips and the last elderberries to gather for another day. Through the village and out the other side, and I trudged up another hill, through autumn trees, bordered by velvet fields freshly ploughed and adorned with a light coating of low lying early mist – not as strong an amount of elf dance as I had rather hoped, but then, there was cloud cover last night. The stars were hidden, and so was the moon, and the clouds had not shifted by this morning. Finally I arrived home again to discover that nearly three hours had passed all in a dream as I wandered, rediscovering this land in the darkness, which I know so well in the light. An adventure to pursue again, faring off the road this time, and perhaps yet again under full moon’s light. Ali I read this with interest and found myself totally absorbed by the brilliant descriptions of the countryside. I could feel the atmosphere, hear the rustlings in the hedgerows and almost wished I had been with you to enjoy the walk. I think you ought to consider becoming a writer. Either non fiction or perhaps fiction. You certainly have the knack of putting words down on paper so to speak. Think it runs in our family with your Dad, Charlie and myself. Although I am really struggling to get ideas. I find the reviews are a bit daunting and then I feel as though my work is pretty rubbish. Thanks for sharing your wonderful very early morning walk. I now live in the countryside and also go on at least 2 walks a day. There are fields stretching for miles here, and I am slowly working out new routes along the way.